The husband of award-winning TV make-up artist Diane Chenery-Wickens, whose body was found near a lane in Sussex, has been charged with her murder. 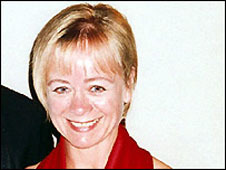 Mrs Chenery-Wickens, 48, disappeared in January on a day she was due to attend a meeting at the BBC in London. Her body was found by a dog walker in Little Horsted on Thursday. The cause of death has not yet been established. David Chenery-Wickens, 51, from Duddlewell, Sussex, is due to appear at Hastings Magistrates' Court later. Mrs Chenery-Wickens was identified by dental records in a post-mortem test. She had worked for more than 20 years on BBC shows including Casualty and the League of Gentlemen. She was also a make-up artist on Pride and Prejudice and won an Emmy Award in 2000 for her work on Arabian Nights. In 2003 she was nominated for a Bafta in the make-up and hair design category for her work on Dead Ringers, missing out to an artist from Little Britain. Dead Ringers impressionist Jon Culshaw made a televised appeal for help in finding Mrs Chenery-Wickens days after she was reported missing by her husband on 24 January.